On November 29, 1864, 150 years ago today, two Union monitors steamed up the James River to engage Battery Dantzler, a Confederate work located 83 feet above the river which anchored the left flank of the Confederate Howlett Line across Bermuda Hundred. 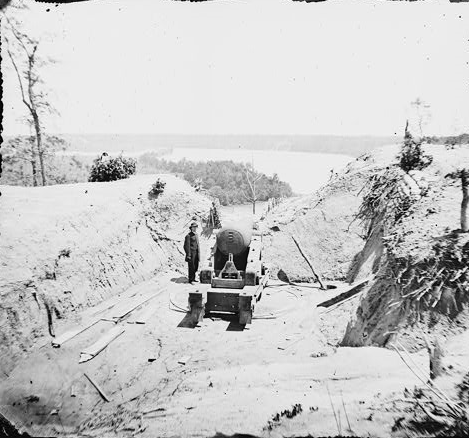 The Southern batteries in the area had been firing on Benjamin Butler’s Dutch Gap Canal project almost daily since construction started in mid-summer 1864, and the Federal navy decided to give a little of this medicine back to the canal’s tormenters. The powerful double-turreted monitor Onondaga and her single-turreted cousin Mahopac moved to within an estimated 2,500 yards of Dantzler, a considerable distance, and opened fire at approximately 9:50 in the morning. 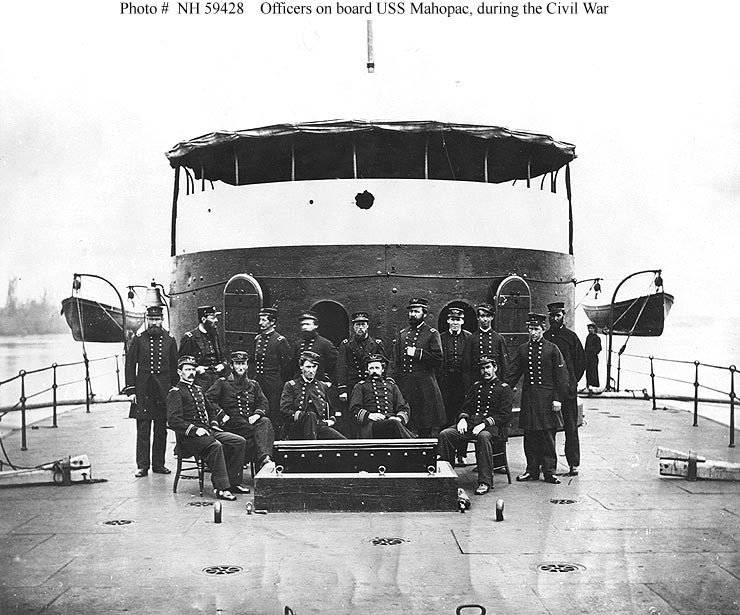 In what was the Mahopac’s first engagement, the Union ships fired 50 times in a little over an hour and a half, an average of one shot every two minutes. Battery Dantzler was estimated by the Federals to have responded with 58 shots in response over the same amount of time. The Union monitors were not alone in this fight. Batteries Parsons, Spofford, and Wilcox added the weight of their metal to the action. These three Union fortifications were all located east of Battery Dantzler along the southern bank of the James River and behind the main Union line across Bermuda Hundred. Major Francis W. Smith, commanding Battery Dantzler, estimated the range at 2,900 yards, and reported his shots hit the monitors several times. His 7-inch Brooke rifle was using armor piercing “bolts,” and Smith complained to designer and Chief of the Ordnance Bureau John Brooke that they consistently started to drift right or left at about 2,000 yards. He asked Brooke to provide any reasons why this might be happening, and what could be done to prevent it in the future. A 24-pounder “Gorgas Gun” burst in Battery Dantzler during this affair. The heavy firing which I observe is reported in the dailies as being heard in the vicinity of Dutch Gap, on Tuesday last [November 29, 1864], resulted from a spirited engagement we had with the enemy’s battery at “Howlett[t]’s House.” As they seemed to indulge rather freely in their compliments to the canal operatives, we concluded to move up and let them have a dose of our patent 15-inch pills. Having anchored within range, the business of the day commenced about 11 a. m. We opened from both turrets, our firing averaging one shot in two minutes; the “Johnnies” were not behind time either, they giving shot for shot, as their battery mounts seven or eight heavy guns. We were assisted by the one-turreted iron-clad Mahopac, her first engagement; and the three Union shore batteries also participated. We kept up a vigorous fire for three or four hours, our 150-pound rifle shells exploding right in their midst, which could not help doing severe mischief. Having satisfied ourselves with the morning’s work, and concluding we did harm enough for one day, we dropped down to this anchorage, where we are overhauling and examining our machinery preparatory to the coming campaign. We will, however, be back again at our old station before that is made public, and no doubt have another set-too with our pugnacious friends, just for the fun of the thing, as attacking land batteries from an iron clad is only play work, for the enemy’s shells can have no effect on us. It’s the rebel torpedoes and other impassable obstructions in the river that prevents us from bombarding Richmond long before now; but there are measures in progress to overcome these even, which measures, however, will have to be carried out before made public. It may be well to mention that we came out of the engagement without a scratch. As you can tell, not much damage was done to either side, the burst Gorgas gun being the most significant casualty in the short, long-range affair, with approximately a mile and a half separating the combatants. The monitors retired a short distance east to Aiken’s Landing where they began to immediately prepare for another effort. You see, this was but a prelude to another sharp fight from December 5-6, 1864, and we’ll discuss that one in less than a week. Naval OR Vol. XI, pages 106–107: Engagement of Federal ironclads with Howlett’s Battery, November 29, 1864. Report of Commander Parker, U. S. Navy, commanding Fifth Division. Naval OR Vol. XI, pages 107–108: Engagement of Federal ironclads with Howlett’s Battery, November 29, 1864. Letter from Major Smith, C. S. Army, to the chief of the Bureau of Ordnance and Hydrography regarding the use of bolts furnished by the Bureau.